Delicious stir-fry. Serve over rice or noodles for a easy meal. 1. In a small bowl, whisk together soy sauce, vinegar, sugar and ginger set aside. 2. 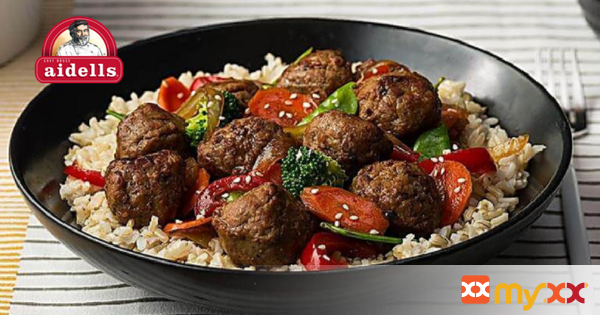 Place the oil in a wok or large skillet over high heat and add meatballs. Sauté for 3 minutes. Stir in the onion and garlic and sauté 2 minutes. Add the vegetables, pour in the soy sauce mixture and bring to a boil. Reduce the heat, cover and simmer 3-5 minutes until vegetables are tender. Stir in the cornstarch mixture and bring the sauce back to a boil for 1-2 minutes to thicken the sauce. Serve over rice or noodles.